The Marlins want to keep catcher J.T. Realmuto, who is under team control through 2020, and have internally discussed the possibility of making a long-term offer. A team would need to make an astronomical offer for Miami to even consider a trade. The Marlins this past winter of course traded away Giancarlo Stanton, Christian Yelich, Marcell Ozuna, and Dee Gordon. They're also open to moving some relievers before July 31. It would stand to reason that Realmuto would be available, too, but that may not be the case. The 27-year-old backstop didn't make his 2018 debut until mid-April because of a back injury, but since then he's done nothing but rake: .306/.359/.544 (150 OPS+) with 11 home runs and 20 doubles in 62 games. That's not out of nowhere, either, as Realmuto was a productive hitter in 2016 and 2017. As well, he's a skilled defender behind the plate. Throw in those years of team control noted above, and it's not hard to see why teams like the Nationals and Brewers (among others) would have interest in dealing for Realmuto. The Marlins, though, reportedly see him as a long-term piece and someone who could still be useful by the time they're ready to matter again. 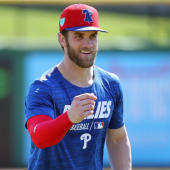 Posturing designed to drive up the asking price on Realmuto? That's possible, too.